There are currently 3 users and 136 guests online. Q: OMG THERE ARE SO MANY GAMES HOW WILL I EVEN DOWNLOAD ALL THESE GAMES? I have a hard time imagining that will make 100, but I'll try anyway during that weekend's down time. I bet I'll make a few. this is an exciting idea!! Just make em real, real, real short. Iterations and remixes are encouraged. 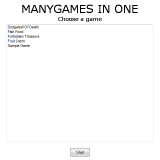 Generated games are also encouraged. None of this has to be "good" either. Awesome! I will try to make 100 games but I'm not sure how I could succeed. If you're posturing this as an official Pirate Kart™, it might be better to use VI instead of III? The established canon can be seen on PIRATE KART DOT COM, though I think the fifth is identified with a V more prominently on this site. I don't mind if it's just a play on the title of Pirate Kart II, though. Also, to my knowledge there isn't a Pirate Kart named "Pirate Kart III" is there? Technically correct! There was Pirate Kart II, two more Pirate Karts, and then Pirate Kart V. This implies (but doesn't explicitly identify) that Vector 3D Jam Multi-Game Pirate Kart is Pirate Kart III and 2012 IGF Pirate Kart is Pirate Kart IV. The smaller size of Vector 3D Jam Multi-Game Pirate Kart means it wouldn't be unfit for spin-off (or "gaiden") status, but the existence of an actual Pirate Kart III would create timeline confusion and put years of competing fan theories to rest with a dangerous level of finality, potentially tearing apart the entire Pirate Kart fanbase. Pirate Kart VI: Pirate Kart III? Would it be possible to change its name, or would that require months of extensive alterations due to the page name data having extended its digital tendrils deep into whatever databases this site runs on? Do people actually want me to change it? Also, this is technically a spinoff of KotMK where the subtitle is Pirate Kart III. when i ask: are the games to be submitted one by one or as one collection in zip packed together? Let's flood the "Newest Games" section! Making a game every half hour is a rather tall order, but I admire your ambition! It could work if folks made small variations on their existing games and submitted as new ones. Kinda like the old NES games that had "Game A" and "Game B" which are technically the same game with slightly different rulesets. I may or may not find the time to participate in this. Right now my mind is sorta wrapped around SNES homebrew stuff. What is a "NEW" game? I am sure everyone would love to see you participate or at least throw in a couple remixes or edits. I know I would love to see what you would come up with. I am not planning on spending the whole 3 day weekend making games. I will probably get done early. That's why I scheduled it for Thanksgiving Weekend. I guess I did not think that this is the time people spend with their families. I was just thinking it was during a school/work break. I hope you can participate! hey guys i don't know if you've seen this before but i found some really helpful information so you can make 100 games in a weekend. check it out. 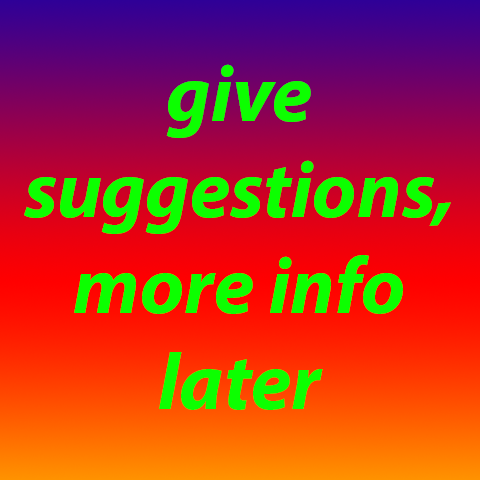 Thank you that is very helpfull !-!-!-!. Guess I'd better get my computer tricked out A-S-A-P. I was thinking about participating in the 100th KOTM ever since I noticed it was coming up, but making 100 games just doesn't sound fun. I'd like to propose an alternate challenge: Make at least 1 game per development platform you know how to use. For example, my challenge list would be: KnP, Flash, Twine, 3D Construction Kit, Unity, Wario Ware DIY, Pinball Construction Kit, and 3D Rad. Churning out 10^2 games just sounds like a chore, but running through the gamut (gauntlet?) of available tools (and maybe trying new ones!) would be less tedious and more adventurous. 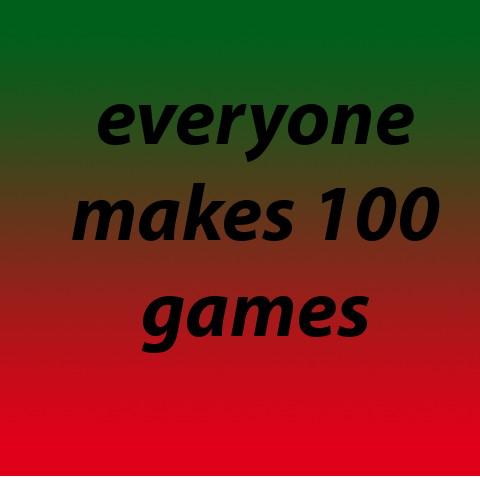 Obviously it would be boring if someone made the same game 100 times. It would also be tedious making really ambitious things a bunch. Think about how brief a game could actually be. Think about how brief making a game can be. It will be like that Pose Maniacs website for games instead of gesture sketch drawings. you can do this instead of quantity. It would not hurt to try. I mainly appreciate you participating at all! Hey, Snapman, do you still have the midis and sound effects from the KnP CD that you mentioned in a bygone age? If so, could you please post them in that thread and link to that thread here for other people to find? I'm sure everyone could do 100 games in 2 hours. However, this event takes place over Black Friday and the following Saturday. It's still a shorter amount of time than the other Pirate Karts. If you do the math it comes to about 1 games per half hour. I haven't made any trainwrecks for ages, but this might change that. I like the idea of hiding weird and unexpected stuff among tons of KnP, Twine, Tinychoice/Flickgame/Plingpling etc. games. For example, in this day and age, anyone can make a quick FMV game with their iPod/iPhone and Twine. And keeping with the spirit of the event and also making tons of other games on top of those will help ensure that those 'gems' are hidden. Edit: I can't find the "Sign Up" tab/button/thingy. Also, more people need to use the full original Klik & Play assets in the first comment of this page. I just turned on signups, just for you! And anyone else who wants an email reminder the day before. Okay, I've decided on what I'm gonna do. 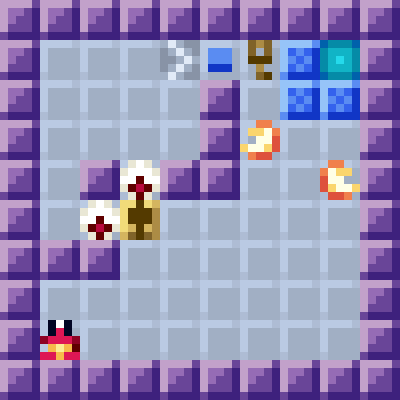 It'll be a rather simple game with 100 micro levels. Feel free to use this or a similar concept in your game too! I think there's going to be a game launcher like with our other Pirate Karts. So they won't count toward the official total number unless they're separate programs. I am not shooting for making 100 games. That's just way too many for me. I have a job and personal projects I need to work on, and of course I also need to leave time for play and generally taking care of myself. I'd be happy to just submit a single game that is tangentially related to the number 100. Basically, see SpindleyQ's comment directly above mine. They could be really short, like 10 seconds each. Anything is a game... if you believe. Yeah, you get it. Anything is a game if you believe it. I'm clearly not saying make 100 Metal Gear Solids. Anything can be a game if you make it. I am going to make a game that will teach people 100 words over 100 game frames 100. So I need 100 words- how do I get them? I am asking y'all to provide me with numbers! Give me some numbers between 1 and 1 million. This will work... trust me. I have done math in my spare time. huh, I would help but I'm not sure how to get numbers. where do they come from? I think clyde's a wizard. Those are some good numbers, thanks clyde.... ihavefivehat, there's no magic, just say whatever numbers you can come up with! I am full up on numbers now so if I get any more I might disregard them. was that a number? did I do it? the sheer hubris, the balls one must have to even think oneself capable of this endeavor. awesome idea... i'll participate if i wind up having time. This is definitely doable. Just plan ahead... bend the rules. Have some templates ready. Get some ideas together before-hand. You can do it. Make all the games. I don't think I will make more than 60. 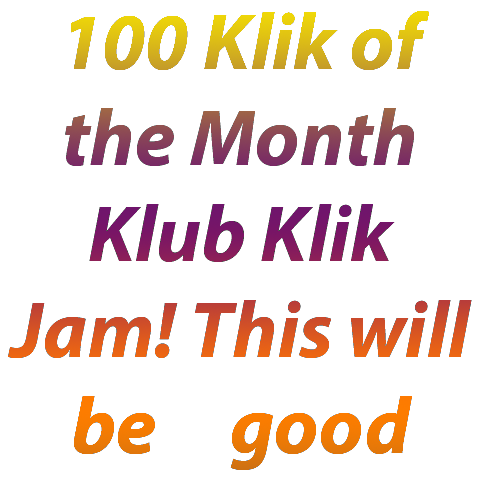 But I will make stuff, and I won't use Klik. I'm ready to upload some thingies! Looks like I made 25 or 26 games so far. I had to make some changes to some of the .rar files just now, since the generic text file credits me for "Graphics, Music and Gameplay" while three of my games had neither. Looks like my two Dumb Political Meme sequels still need tweaks. I will get to it tomorrow. So far, I'm responsible for almost 50% of all Kart #100 games! Not bad. That was a number for MNO. I'll try to put something together for this this weekend. TBH, I'll be lucky if I get to one game. I'll go from there. For the last two weekends I've panicked a bit thinking I missed this, but now the weekend is correct and I am ready! Don't forget to include your source projects/code. It's a nice idea, and we should do that more often! One down, 99 to go. ugh. Just submitted the 100th game, does that count as success?